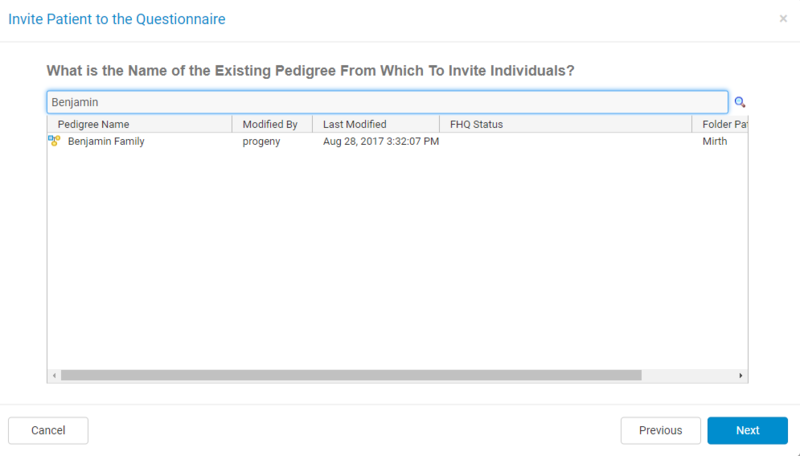 The Invite Status module is used for sending out Family History Questionnaires (FHQ’s), viewing the status of questionnaires, and applying filters to the questionnaires list. Select the questionnaire(s) to view all of their invitations in the view pane at the bottom of the page. You can filter the list of invitations to view invitations with the selected status. Invite Created – the invitation has been successfully created. Invite Sent – the invitation has been successfully sent. Questionnaire Started – the patient has logged into a questionnaire sent through either email or generic link. Questionnaire Partially Completed – the questionnaire has been started and the user has clicked on the Save, Finish Later button in the questionnaire. Questionnaire Completed – the patient has clicked the Submit button in the questionnaire, and the questionnaire has been completed. Invite Declined – when the consent page has not been agreed to. Reminder Sent – a reminder has been sent. Completed Manually – an invite status was updated to Completed Manually from within Progeny. Inactive – an invite status was updated to Inactive from within Progeny. Reviewed – an invite status was updated to Reviewed from within Progeny. Filter the list of invitations displayed based on the selected user(s) that sent the invitation. Filter the view of invitations by how recent the patient was invited. Filter the view of invitations by how recent the questionnaire was started. Filter the view of invitations by how recent the questionnaire was completed. Filter the view of the invitations even further by selecting the Query Formats drop-down and selecting either Load Query to load an existing query format or New Query to create a new query format. You are able to select any field in the database by using the folders on the left pane and then drag to drop the field into the right Query pane. Once you have the field(s) in the Query pane, you can then specify the operator and value. 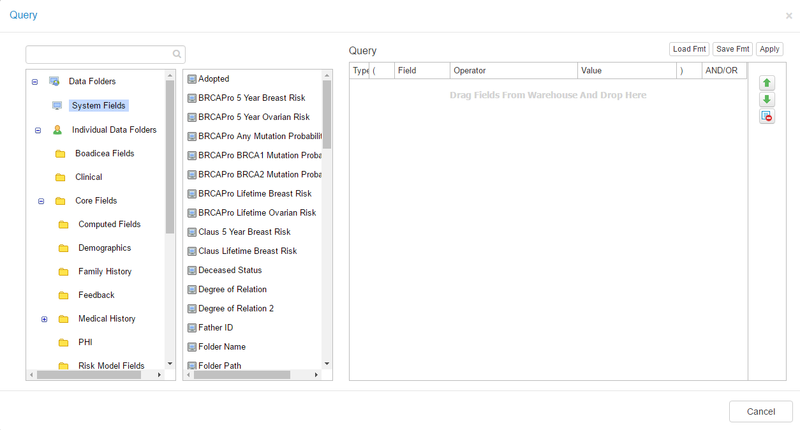 This Query pane allows the creation of complex queries which can include multiple fields with different values as well as using the AND/OR to specify multiple conditions. Once you have created the query format, you can choose to save it which will then open another window asking to select the folder to save the format in. Give the format a name. You also have the option to delete a format from the selected folder, delete the selected format folder if it is empty, and optionally, give the format a description. 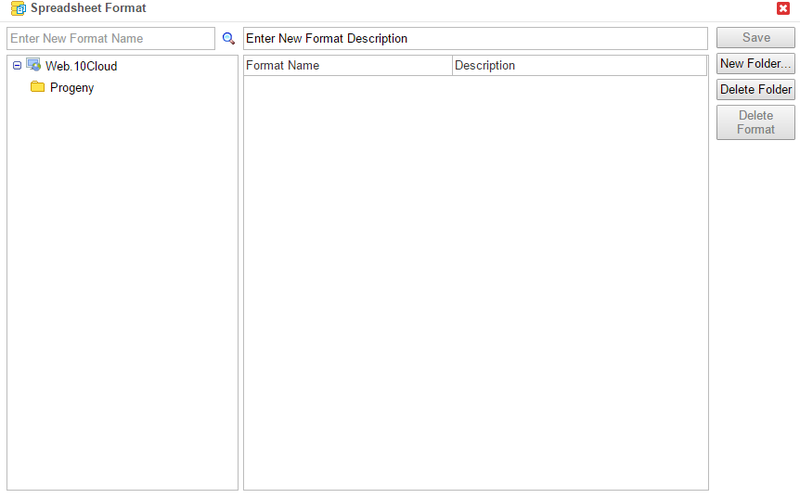 After the format is saved, click Apply to run the query and apply the filter to the invitations view. Click the Invite Patient button to invite a patient to fill out the FHQ. The first step is to select which questionnaire to send to the patient. New Patient – invites a new patient that is not in the Progeny database. You will then be asked which folder to save the pedigree in, the name of the pedigree, the gender of the proband, and the email to send the questionnaire to. Existing patient or relative – invites a patient or relative that is already in the Progeny database. Once you select the questionnaire to send, you will then have to select either an individual, members of one family, or patients who meet specific criteria. Individual – an individual in the database that is not part of a pedigree, also called a singlet. Members of one family – here you can select a member of a family to be invited. Patients who meet specific criteria – here you can select a query format to filter the through database so you can invite patients that meet the criteria in the query. You would first select the query format, then make changes to the query, if necessary, which will then display all individuals that match the query where you can select the one(s) to invite to the questionnaire. You can also create new formats by clicking the New Format button. This will bring you to the Review/Edit Query window. From here, you are able to add fields from the database to create a query format. You can then click Save Format to save the newly created format. It will then open a Spreadsheet Format window where you can give the created format a Format Name and optionally, a Format Description. You can also create a new format folder, delete a format folder, and delete a query format.At the end of inviting a patient, you can then edit the email before it is sent to the customer. Here you can make last-minute changes to the template before it is sent. Note: This will not overwrite the existing Invite Email template. The actions menu provides a quick way to perform common actions for the individual. New Invite – sends a new invitation to the individual. Send Reminder – sends a reminder email to the individual. Update Status – manually change the status of the questionnaire to Completed Manually, Inactive, or Reviewed. Lock Invite or Unlock Invite – locks or unlocks the invitation so that it cannot or can be accessed. View Invite History – shows a history log of the invite statuses. Open Pedigree – opens the individual’s pedigree. Open Datasheet – opens the individual’s datasheet. Generate Letter – generates a letter for the individual.